Are your operating expenses for processing material too high? If so, you may need a radial stacker conveyor. We list some reasons that may be the case. Health and safety is one reason to own a radial stacker stockpile conveyor. When using a radial stacker, a process including moving vehicles is removed. Studies have shown that over 40% of work site accidents occur due to moving vehicles. There are benefits for the environment with using a stockpile conveyor. On site emissions are reduced as well as there being reduced dust levels. Noise pollution is greatly lowered; a key factor when working in a built up area. The California state minimum wage will rise to $15 per hour soon. Operators often get paid much more, and so knowing that each worker is bringing added value is critical. By using a radial stacker conveyor, the labor provided by the operator can be better used elsewhere. All the downsides of human labor are removed in this process and it will now give 100% capacity. Expensive overtime costs are reduced/removed. A radial stacker can work with no downtime, which leads to the next point. As stated above, conveyors have the ability to operate at full work rate every hour of operation. This means time is spent doing what makes money – loading the crusher. 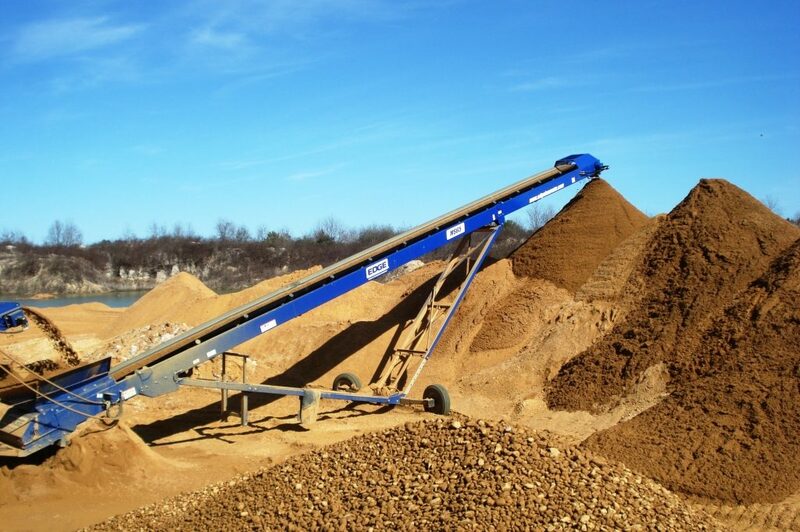 Many crushers have short discharge conveyors, which means smaller stockpiles. In these cases, it is often a full time job just keeping these piles from damaging the crusher conveyor head drum! With the introduction of a radial stacker, operators can leave crushers and screens running without the need to move material. The introduction of stockpiler conveyors means no double handling of material and therefore cuts the cost per tonne. Cash flow is a continuing problem for one in five small business owners. Larger businesses are as likely to encounter cash flow problems, if not more so, than the smallest. On average, wheel loaders demand a high retail price of $282,078. This is a spend that may hinder a business from financing other needed equipment. Buying a radial stacker can help your business to grow. Stockpile conveyors represent a substantial saving and an alternate to wheel loaders stockpiling material and therefore freeing vital funds to help a business expand. Adding radial stacker conveyors to stockpile material minimises operating costs. A site with wheel loaders moving material requires more planning, while also having higher maintenance costs. Fuel expenses are also reduced greatly. Studies have shown that wheel loader maintenance can cost 95% more than conveyors annually. Along with this, fuel consumption can also be reduced compared to using wheel loaders. The EDGE TS Series consumes on average 5 litres of fuel per hour. The sixth benefit of owning a Stockpile Conveyor is the high quality uniformed aggregate. This is vital in the production of many materials such as concrete and asphalt. Heavy equipment such as wheel loaders can damage aggregate such as expanding clay, shale or slate through compacting and crushing. Better material means increased value, and ultimately a more impressive bottom line for your company. Every company is different; at Greenrock we understand that. That’s why we have a huge range of radial stackers for all needs. We can offer different power sources to suit individual needs and we appreciate any opportunity to help you save money and streamline your processes. Whatever your job, we have a conveyor for you!